Wisdom teeth removal is one of the most common dental surgeries done each year in the United States. The wisdom teeth are known as the last molars on each side of the jaw. They are the last set of teeth to erupt in the mouth, usually when a person is between the ages of 16 to 25. It is very common for people with wisdom teeth to not have enough room inside their mouths for these teeth to erupt. When the mouth cannot accommodate the wisdom teeth, they need to be removed in order to prevent damage and infection to the mouth. Wisdom teeth themselves are just like the other molars in the mouth. However, it is the fact that they come in at such a later time that makes them an issue for many people. Most people who are in their upper teens have already developed all of their permanent teeth and have undergone any necessary orthodontic treatment. Wisdom teeth that begin to emerge in the mouth pose many issues because they are often impacted or they come in at a crooked angle. This puts a great deal of pressure and strain on the other teeth, which can not only cause the teeth to become misaligned (undoing all of the orthodontic work that has been done), but it can also leave the mouth susceptible to infection. Wisdom teeth removal is a relatively routine procedure. At Gold Hill Family & Cosmetic Dentistry, Dr. Kavi Sagunarthy and Dr. Jennifer Mokris offer painless tooth removal. 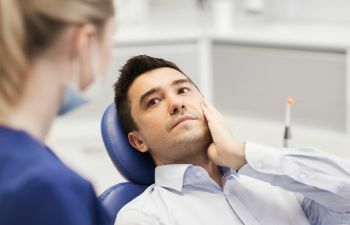 Our entire dental practice is equipped with friendly staff and added amenities to keep patients comfortable and relaxed during their wisdom teeth removal procedures. Many people have their wisdom teeth removed before any issues become apparent as a way to prevent problems later. This surgery is typically less complicated, and the tissue and bone are known to heal better when wisdom teeth removal is done proactively. At Gold Hill Dentistry, we are here to serve patients with all of their oral health needs. We offer expert wisdom teeth removal. Our office is equipped with amenities to make your dental experience a positive one. We look forward to being your family’s home for the highest quality dental health care here in Fort Mill. Please contact us today.